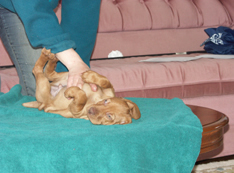 Puppy testing is done at seven weeks to help us determine energy levels, natural ability, social skills and dominance. 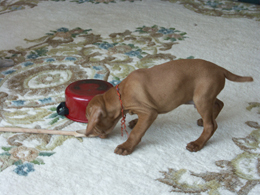 Although not 100% accurate, it helps us match puppies and owners. 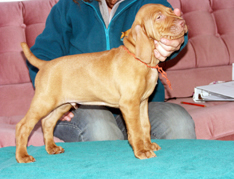 In the top row of photos: Ruger is being stacked for conformation in the first photo. 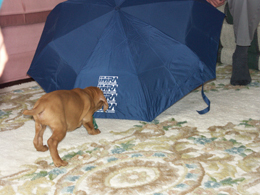 The first shot shows Bentley investigating the umbrella which has been popped open and dropped as he faces it. 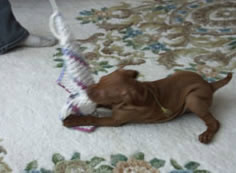 Panna not only demonstrates her "chase " instinct, she catches the cloth Liz drags around . 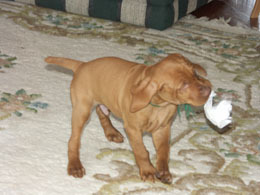 Bentley is showing his natural retrieve as he brings a crumpled paper back to Liz . 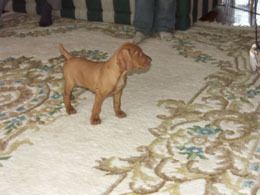 The one pup not in any of the photos, Cara, was a little faster than the camera. That gives you an idea of her energy level and drive. She has gone to Newfoundland where she is charming all she meets on the "rock". 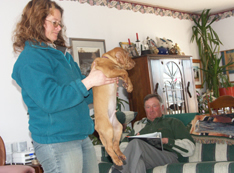 While not pursuing any titles, she hopes to hunt with her new dad in the fall.